Lookers, Leapers, and Landers illustrate a model of human learning based on the principle of Knowledge of Results. we learn to the extent we know the outcomes of our efforts. 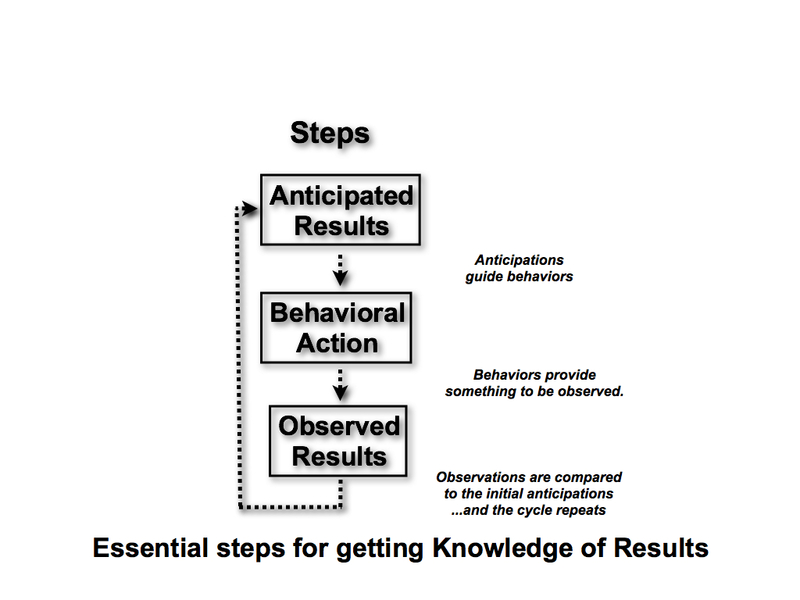 Getting Knowledge of Results requires three distinct steps: Anticipated Results, Behavioral Action, and Observed Results. Anticipated Results are any mental activity which guides some overt Behavioral Action, the results of which can be observed and compared to the initial Anticipated Results. This is essentially the scientific method. 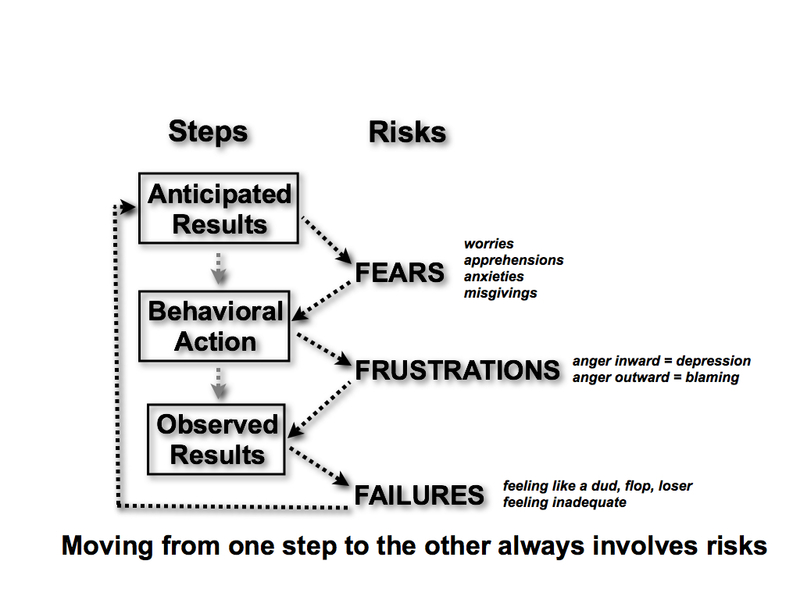 All three steps are necessary for getting Knowledge of Results. To the extent that any one of them is missing or weak, there is no Knowledge of Results, no learning occurs. Take anticipations (Looking), for example. If you don’t know where you’re going, how will you know when you get there? 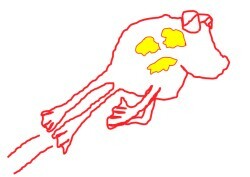 Also, behavioral actions (Leaping) can be complex and difficult to do. But if there are no behaviors, there is nothing to really observe. 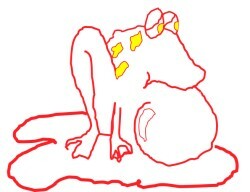 Finally, if behaviors are not actually observed, there is no Landing, since there is nothing to compare with the initial Anticipated Results. The point here is, all three steps are essential for the learning cycle which can last a few seconds or an entire lifetime. These three steps form the conceptual framework for learning. But in the real world there is more! Learning, real learning, always involves risks which are encountered as one moves from one step to the other (Looking, Leaping, Landing). Fear can stop learning by immobilizing one from going into action, speaking up, and expressing oneself. 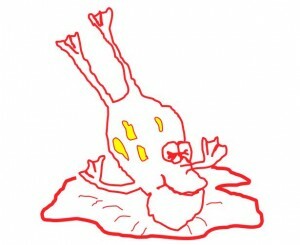 Frustration can stop learning whenever blaming occurs and personal efforts are discounted. Failure stops learning whenever the observed results are too painfully far from the initial expectations. So…learning requires risk-taking, and it is precisely in taking risks that a learner lays claim to ownership of accomplishments. The capacity to take risks is the mark of a learner. 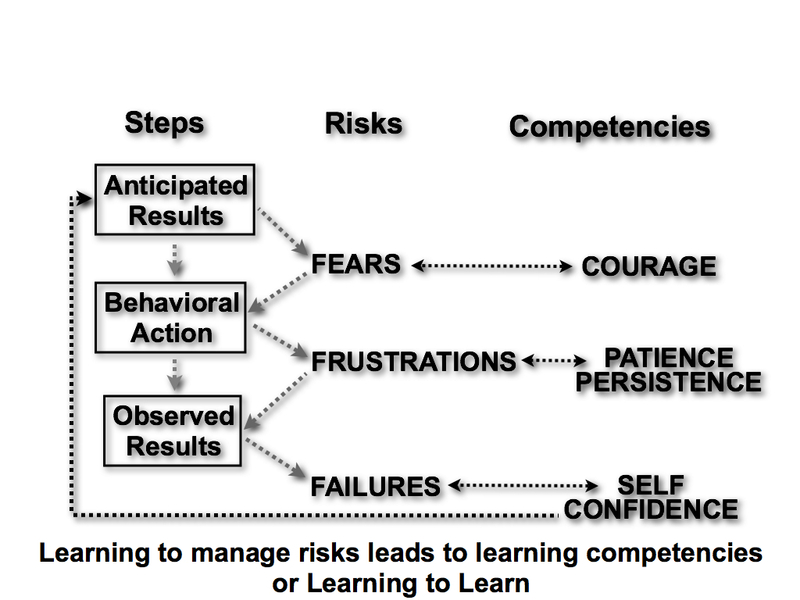 The major competencies of learning require acceptance of personal risks. Courage is meaningless without a sense of personal fear. Patience and persistence do not imply passivity but a respect and ownership of one’s own struggle and hard effort. Self-confidence is measured by failures overcome, efforts made, and having hopes one is not afraid to strive for. These learned competencies provide the basis for generalization of learning to new experiences. Learning how to walk, hold a spoon, ride a bicycle, lead to driving a car, mastering computer code and ever new horizons. As competencies increase, learners expand their expectations and take greater risks…and are constantly being pulled to greater competencies. Children learn quickly because they are less aware of the risks while adults gain experiences that make risk taking more difficult…unless their competencies are also learning. Believe in one’s dreams, conceptualize them and formulate a plan on how they might become real. Risk going into action, despite apprehensions. Act boldly yet conscientiously so that actions are as consistent as possible with intentions. Evaluate the effectiveness of one’s actions by observing results. Winners are losers who keep on trying! Human relationships are learned events. They are not made in heaven or Disneyland but unfold daily right before our very eyes face to face. Relationship learning is not just a process where individuals learn to deal with each other but a process where they learn how each other learns. To understand how a person learns is to listen to dreams, fears, frustrations, and failures and discover with what courage and patience self-confidence was won. Relationship learning involves teaching others how we need to be understood in order to risk learning. When learners learn to believe not only in themselves but in each other, they discover new risks and competencies which as individuals they could not possibly have anticipated. Behavioral Actions are in a bold box to indicate they are the only part of the relationship learning process that is visible and observable. What is not observed is inferred through observations. We call them assumptions, inferences, or hypotheses. Fears, for example, are not necessarily observable in face-to-face interactions, but they could be. Being “cool” can be understood as an effort to hide one’s fears when face to face. 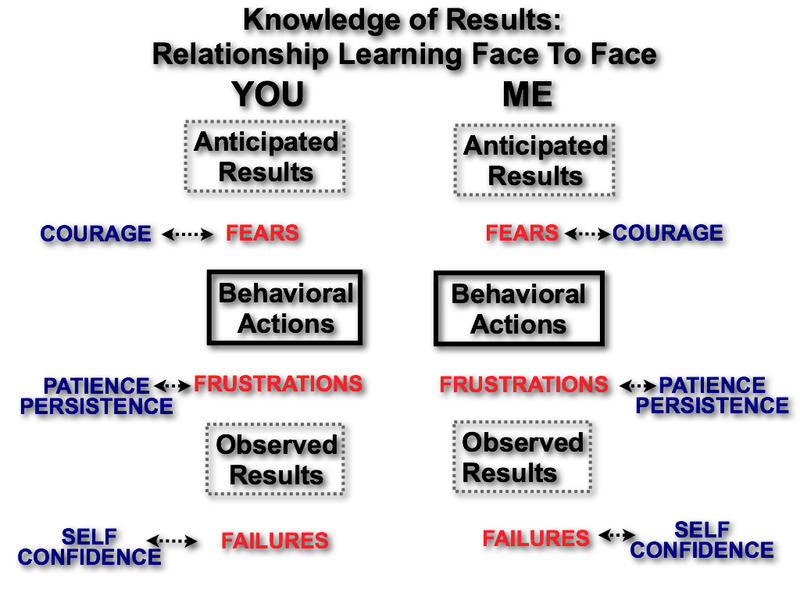 Just as individual learning is a testing process (where observed results of behavioral actions test the accuracy of anticipated results) so too relationship learning can be understood as a face-to-face testing process.